The new service plaza at Interstate 95's southbound Exit 22 interchange in Fairfield opened for business Thursday. The new service plaza on the southbound side of Interstate 95 in Fairfield opened Thursday, completing a multi-year construction project on the local stretch of the highway that saw completion of the northbound service plaza late last year. In addition to a reconfigured ExxonMobil fueling area, the new plaza houses fast-food outlets that include McDonald's, Subway and Dunkin' Donuts, as well as an Alltown Convenience Store. The local service plazas, like others along the state's limited-access highways, are managed by Project Service LLC. The firm has a 35-year contract with the state to renovate and operate 23 service plazas on the highways. Paul Landino, the president and CEO of Project Service, said in a press release announcing completion of the Fairfield service plazas: "Our Connecticut service plaza team is excited to provide great food choices, clean restrooms, fuel and convenience to the large number of travelers who pass through the Fairfield area. 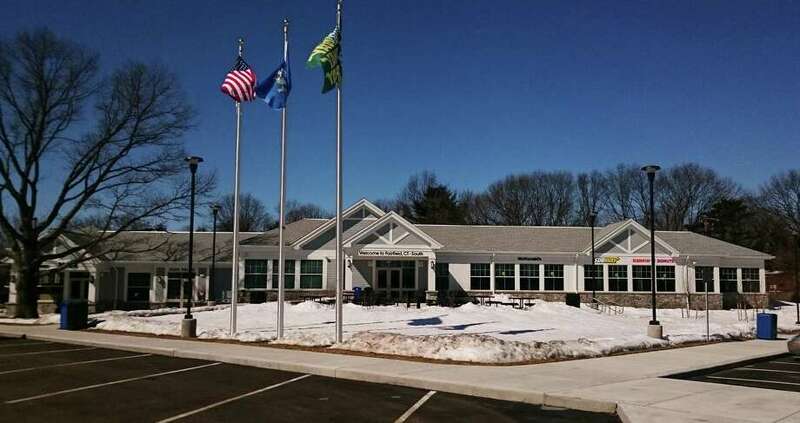 We have completed 20 of the service plazas so far, and look forward to continuing to serve those traveling on Connecticut's highways as we work to renovate the remaining service plazas in the state." Asked about neighborhood pleas for sound and safety barriers to be erected around the plazas, Landino said Thursday that fencing has been erected on northbound side and some modifications are being made. Basically, he said, the fencing does not allow people to walk from the rest stop into the neighborhood. On the southbound side, fencing will be erected on the plaza property, again to prevent people from going into the neighborhood. Discussions are also planned with the state over planting more trees to buffer the view, but trees would be on the other side of a highway on-ramp, which is the state's responsibility. "I think this basically addresses the majority of the concerns," Landino said. "The neighbors mean a lot to me. We've tried to reasonably deal with any potential concerns." The new service plaza features several environment-friendly features, according to Landino, including photovoltaic solar panels, single-stream recycling, water-efficient restrooms, "super-efficient" heating and air-conditioning units, and idle-reduction technology for tractor-trailers. The plazas also have free WiFi and backup power generators for use during a power outage.